The Big Sick is an unlikely title for a romantic comedy. But don’t let the title throw you. This is a great movie! It is a comedy about the relationship between a Pakistani-American man and an Anglo American woman in Chicago. If you’re looking for an alternative to the superhero movies that take over the movie theaters in the summer, The Big Sick may be just what you’re looking for. The Big Sick was written by Kumail Nanjiana, a Pakistani-American actor/comedian and his wife, Emily V. Gordon, based on their real life relationship. In the film, Kumail (who plays himself) is performing as a standup comic in a club, where he meets Emily (played by Zoe Kazan), a graduate student who is in the audience. The two hit it off and begin dating. Meanwhile, Kamail’s family is hoping that he will marry a Pakistani Moslem woman. His mother continues to invite women over to dinner when she knows Kamail will be there. Kamail does not want to upset his family, so he does not tell them about Emily. When Emily finds out that Kamail’s mother is trying to arrange a marriage for him, and that Kamail has never told his family about her, she accuses him of being dishonest and breaks up with him. Soon after the breakup, a friend of Emily calls Kamail to tell him that Emily has been taken to a hospital for an infection and is in intensive care. Kamail goes to the hospital, and realizes that he needs to inform Emily’s parents, who live in North Carolina, about her serious illness. Her parents, Beth (Holly Hunter) and Terry (Ray Romano), travel to Chicago and come to the hospital. At first they want nothing to do with Kamail since Emily told them that she broke up with him. Eventually, however, they warm up to him. 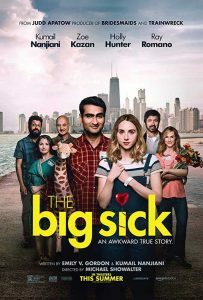 The title The Big Sick refers to Emily’s illness. For much of the film, Emily is in a coma. This dire situation forces Kamail to re-evaluate their relationship, and to decide what he really wants in life. In addition, Kamail is forced to interact with Emily’s parents, who have their own issues. This is a complex movie. It’s a challenge for a comedy to deal with topics as serious as a life threatening illness. In addition, there are family dynamics, and the pressure of different cultures. There’s great sensitivity to the cultural and religious concerns of Kamail’s family, handled with a sense of humor. In effect, the only character that comes across as unlikable is a heckler at the comedy club who hurls a shockingly prejudicial comment at Kamail. However, the remark causes Beth, who is at the club and at this point ambivalent in her feelings about Kamail, to come to his defense. It’s a great moment for the great actress Holly Hunter. It’s so good to have her back on the screen again! The film is rated R for language, which includes many uses of a certain four letter word that some may find offensive, as well as some non-explicit sexual scenes. It took me a few minutes to get into The Big Sick, and it seems just a few minutes too long. But once it gets going, this is a very likeable, well written movie that explores the ups and downs of human relationships.